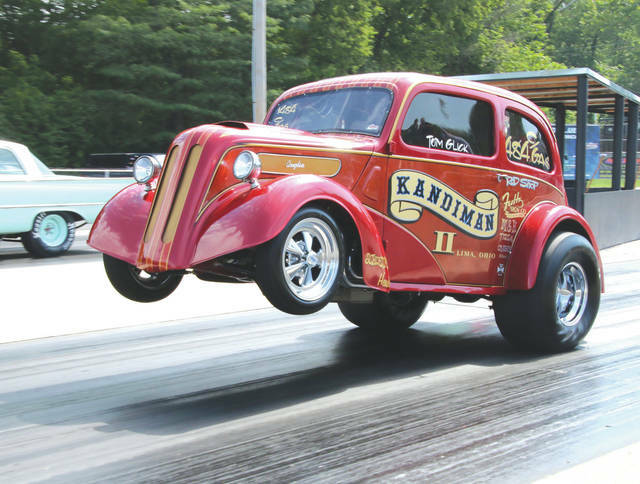 Old-time drag racing machines like this Kandiman II Anglia gasser are expected to be on hand Saturday, Aug. 18 for the annual Gathering of the Geezers drag racing reunion at Kil-Kare Dragway. 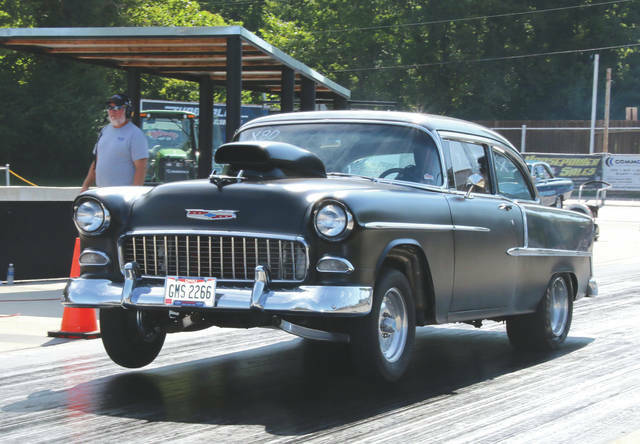 A 1955 Chevy drag racer launches off the starting line during a recent Gathering of the Geezers event at Kil-Kare Dragway. The 10th annual drag racing reunion is scheduled for Saturday, Aug. 18 at the famed concrete drag strip. 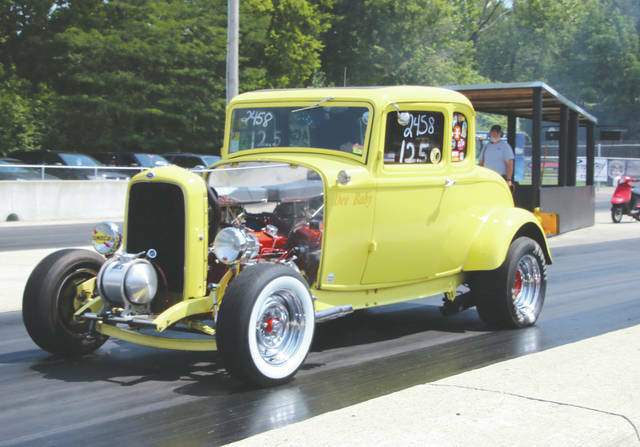 Spiffy yellow Ford Roadsters and even older drag racing machines from times past will convene on Kil-Kare Dragway’s concrete drag racing surface for the 10th annual Gathering of the Geezers drag racing reunion, Aug. 18 in Xenia. XENIA — Racing fans who may be missing the drag racers of long ago can breathe a little easier, or at least they can breathe in some fumes and burning tire rubber, as the 10th annual Gathering of the Geezers old-time drag racing reunion will convene once again at Kil-Kare Dragway. According to the online schedule, Kil-Kare’s spectator gates are set to open at 8 a.m. with time trial runs starting at 10 a.m. on Saturday, Aug. 18. The first head-to-head battles among drag racers in cars from 1987 or older will start at 2:30 p.m.
“We won’t start any engines until 10 o’clock, because we wanna respect our neighbors,” event organizer Ed Crowder said on Thursday. “…by around 1 o’clock we will introduce our Hall of Fame class for this year, racing will probably start at around 2:30, then by about 3 or so we’ll recognize the Top-50 show cars at the track. For obvious safety reasons, drivers must drive their drag racers for 14-second or slower passes during the race car rides portion of the day’s fun. Trophies and 50 Lowes Goodie Baskets, filled with various coupons and swag from area businesses, will go to the top 50 show car winners. Crowder has a panel of judges who will determine the recipients. A swap meet, and the Buckeye Stock and Super Stock Drag Racing Series will also take place. A Top Eliminator racing category, featuring Nostalgia, Modified, Street and Street Rod racing divisions will be contested with the winner earning two tickets to the NHRA U.S. Nationals, which will run Aug. 29-Sept. 3, at Lucas Oil Raceway in Clermont, Ind. just west of Indianapolis. Crowder says a “Grandpa Eliminator” class, with cars dated 1987 or older, will award $350 to the winner, $150 to the runner-up and $25 bucks for the semifinalists. Competitors must compete under NHRA rules. Helmets and safety belts must pass inspection prior to racing. No electronics are allowed. The rain date for the event will be Sunday, Aug. 19, with the same schedule of events. Visit kilkare.com for more details.